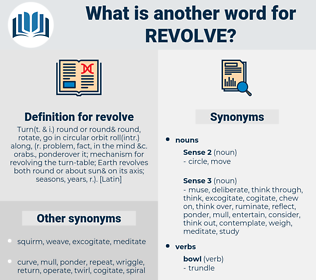 What is another word for revolve? 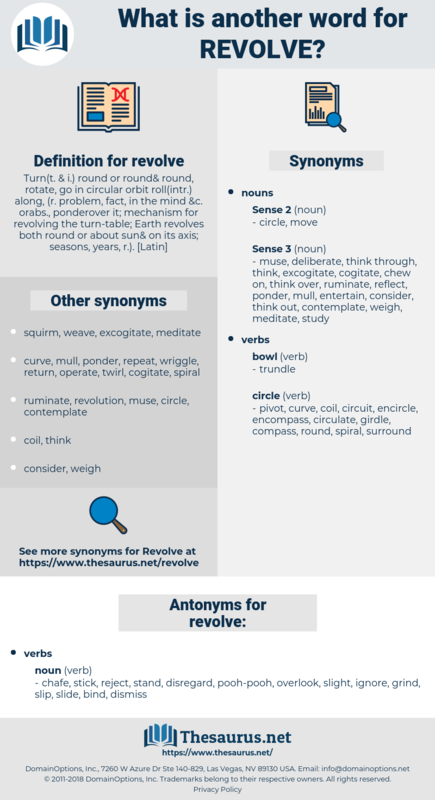 rotate, evolve, spin, turn, focus, rev, move, relate, resort. chafe, stick, reject, stand, disregard, pooh-pooh, overlook, slight, ignore, grind, slip, slide, bind, dismiss. Such were the meditations of Philip Vanderdecken, and long did he revolve such chances in his mind. For plays in which the palace - front was not appropriate, scenery was employed to cover it, being painted on canvas or on boards which could be pulled aside; other scenes were stretched on frames, which could be made to revolve so as to present various faces. ripe olive, ruffle up, raffle off, rauvolfia. spin around, twirl, twiddle, drive in, wheel, gyrate, screw, swirl, spin, reel, transit, wheel around, whirl.